It’s one of those curious behaviors dogs do: you give them a nice belly rub and they start kicking or shaking their rear leg, what gives? Many dog owners have been wondering what is going on when their dogs start moving their leg upon being scratched. While the possible reason why this happens has been extensively studied for many years, despite decades of research, certain key aspects of this leg-kicking behavior still remain unknown. Today we’re discovering what’s likely behind this mysterious behavior, but before we do that, here’s our trivia question of the day! Why do dogs start kicking their legs when you pet them? D: It’s a voluntary action. The dog is trying to take over the task of scratching. The correct answer is: drum roll please…….. The correct answer is: B, it’s a reflex that is activated when you pet certain areas. 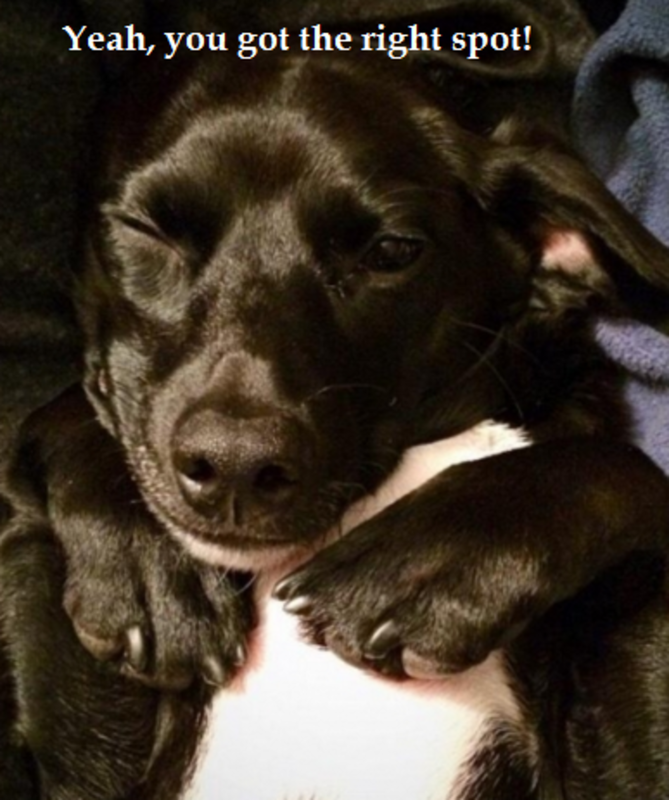 So why do dogs pump their legs when you rub their tummies? Turns out it is a reflex, basically an involuntary mechanism that occurs as a response to a stimulus, and thus, happens without conscious thought. In layman terms, your dog can’t control it, he just gotta do it. One of the first people to be intrigued by this reflex was a certain Sir Charles Sherrington, an English neurophysiologist who decided to study this reflex more closely. Sherrington was very interested in anything that involved reflexes and neurological activity and his many studies helped us attain a better understanding of the central nervous system. Thank you, Sir Sherrington! One main question to ask is why does this reflex activate only when the dog is scratched over a certain area? Those back legs after all do not seem to give any signs of moving or kicking when the dog is scratched on the top of the head or in the chest area! All the surface of the dog’s skin is covered by many sensory neurons that are activated by stimulation, but there is a specific area in particular that seems to activate the scratch reflex. 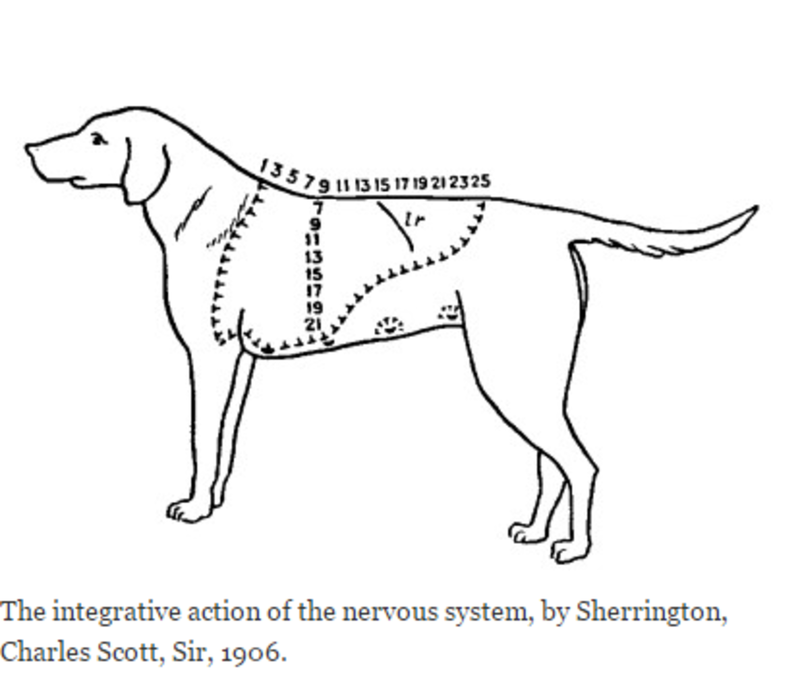 According to J. E. R. Staddon, author of the book “Adaptive Behavior and Learning,“this specific saddle-shaped area is called the”receptive field of the reflex” and touching a spot within this area may therefore elicit the dog’s involuntary scratch reflex. Why is only this area triggering this behavior compared to other areas of the body? Here’s one possible explanation. The scratch reflex may have an adaptive purpose of ridding the animal from fleas or other dangerous parasites in an area (the flanks) that isn’t highly mobile as say, the tail or the dog’s front or hind legs. The scratch reflex therefore may allow the dog to quickly attempt to remove the stimulus by using his rear leg. Anther theory comes from the book “Why Do Dogs Drink Out of the Toilet?” by Dr. Marty Becker and Gina Spadafori. According to the book, the upper part of the dog’s flanks or on the belly are areas where fleas tend to congregate, so those leg kicks are likely an effective means for pest control. Mother Nature’s version of an automatic fly swatter. As seen, the scratch reflex is one of those fascinating things dogs do that are quite interesting to discover! Why though would it be a reflex and not a conscious, voluntary movement? Dr. Lore Haug, a board-certified veterinary behaviorists thinks it’s a matter of urgency. 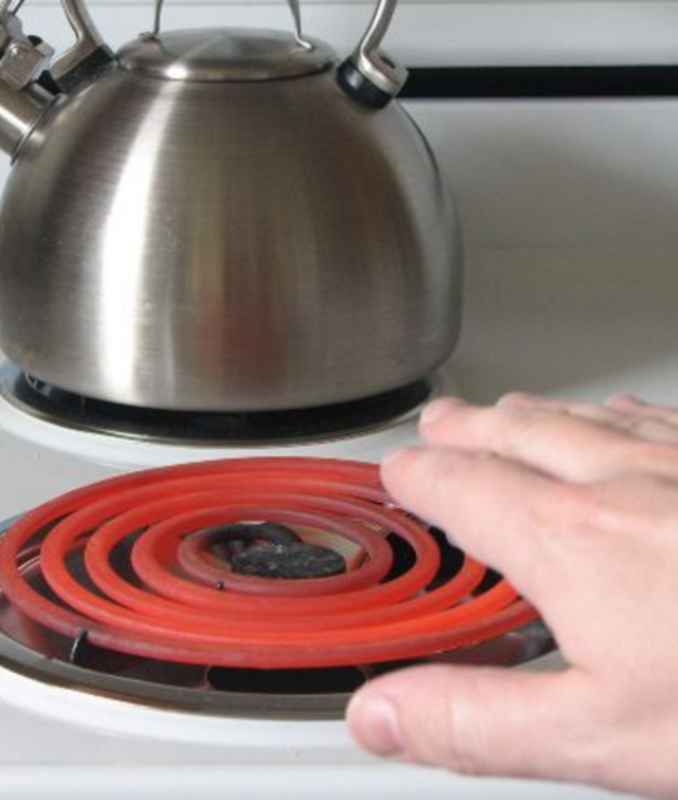 In an article for Popular Science, she compares it to our reflex of withdrawing our hand from a hot stove. Sherrington’s studies, have revealed some quite interesting findings about the scratch reflex. Following are some interesting phenomena he has observed in his studies. The Warm Up. 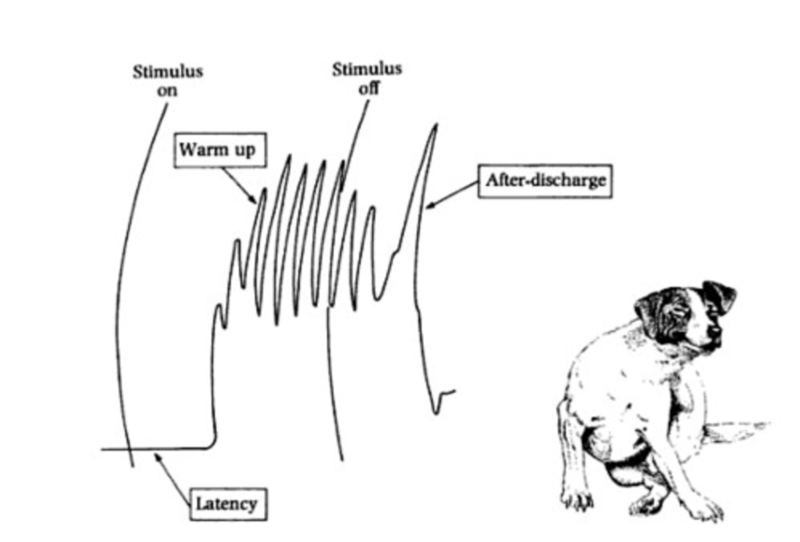 Sherrington also noticed how the scratch reflex in dogs involves also a warm-up period. He mentions that when the leg kicking action begins, it doesn’t reach a maximum level of intensity right away, but rather, it builds up in intensity gradually. The first leg kicks therefore consist of slight sweeping motions compared to the broader ones occurring a bit later. The After Discharge. Just as there is a latency period, a brief delay before the kicking-leg action takes place, there is an after discharge moment, where the leg licking still occurs despite you stop scratching your dog. Basically, upon removing your hand, you may noticed that your dog keeps moving a leg for a little bit. Intrigued by all this? Watch the Scratch Reflex in Action! Did you notice the warm-up period?